I am a big fan of your site! I'm also a big fan of old-fashioned cookie recipes. This recipe for Wheaties-Coconut Cookies is from a vintage 1965 cookie recipe booklet. It's the first recipe in the book and is credited to Mrs. Lyndon B. Johnson, wife of the President of United States, at the time. It immediately caught my eye because I love coconut and coconut cookies. It's a simple butter drop cookie dough -like a chocolate chip cookie dough - but with shredded coconut and Wheaties cereal - instead of chocolate chips. I think they're very sweet, crispy, chewy and delicious. 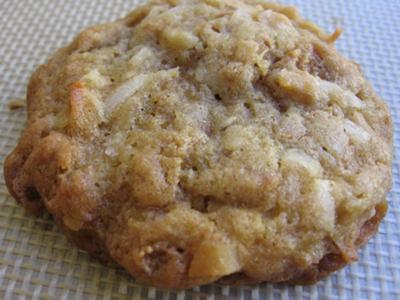 A great recipe for people who love chewy coconut cookies. You could definitely cut back on the sugar a little since the coconut adds a lot of sweetness. 1. Adjust an oven rack to the center position and preheat oven to 375 degrees. Lightly grease your cookie sheets or line them with parchment paper. 2. In a small bowl whisk together the flour, baking soda, salt and baking powder until well blended. 3. In a large bowl beat together the butter and sugars with an electric mixer until creamy. 4. Add the eggs and vanilla and beat until well blended. 5. Stir in the coconut until well distributed throughout the dough, then stir in the flour mixture just until well blended. 6. Stir in the Wheaties cereal, mixing just until blended. 7. Roll the dough into walnut sized balls spacing them at least 2 inches apart. 8. Bake, one cookie sheet at a time, in the center of the oven for 10 to 12 minutes or until they're golden brown. 9. Remove from the oven and let cool on the cookie sheet for a minute and then transfer the cookies to a wire rack to cool completely. 10. Repeat with the remaining dough, being sure to allow cookie sheets to cool completely before using them again. ~ Like so many old cookie recipes, this one called for a mixture of butter and other shortening. When old cookbooks say "shortening" they are referring to all fats including butter, margarine, lard and vegetable shortening. I prefer to use mostly butter in my cookies but sometimes use a non-hydrogenated shortening - like the one from Spectrum. Use whatever you like best. ~ I think cornflakes, bran flakes, crisp rice cereal or some other kind of whole wheat flakes would all work well in place of the Wheaties. ~ Substitute all or part of the all-purpose flour for white wheat or whole wheat pastry flour. ~ To turn these into Ranger Cookies decrease the coconut to 1 cup and add 1 cup old fashioned rolled oats.